A transient ischemic attack (TIA) is an event, sometimes called a mini-stroke, with stroke symptoms that lasts less than 24 hours before disappearing. While TIAs generally do not cause permanent brain damage, they are a serious warning sign of stroke and should not be ignored! Within 2 days after a TIA, 5 percent of people will have a stroke. Within 3 months after a TIA, 10 to 15 percent of people will have a stroke. If you have any of these symptoms or see them in someone else, even for a short time, call 911 or have someone take you to the hospital immediately. Treatment can be more helpful if given quickly. Stroke strikes FAST. You should too! What causes a TIA? Blood vessels carry blood throughout the body. When a blood vessel in the brain becomes blocked for a short period of time, the blood flow to that area of the brain slows or stops. This lack of blood (and oxygen) often leads to temporary symptoms such as slurred speech or blurry vision. How can TIA be managed? The goal of TIA management is to prevent a future stroke. The medicine and therapy used depends on the exact cause of the TIA. In addition to lifestyle changes such as diet and exercise, your doctor may recommend drugs to treat high blood pressure, high cholesterol or heart disease. These changes may reduce your risk of further TIA or stroke. There are many medicines that help prevent blood clots from forming, reducing the risk of full-blown stroke. 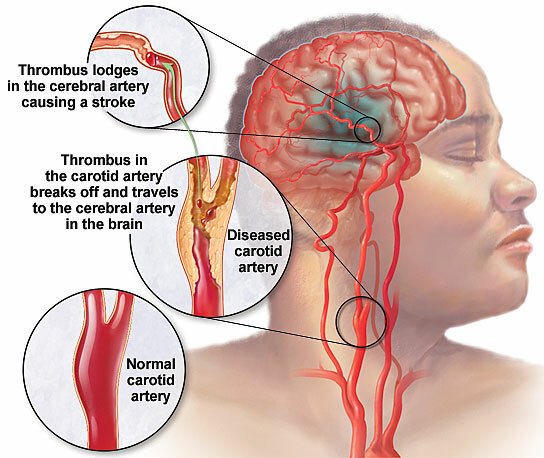 If a TIA is caused by blockage in the main artery in the neck that supplies blood to the brain, called the carotid artery, surgeries may be required to open the artery and prevent a stroke. These procedures are known as endarterectomy and stenting. Talk to a doctor about the best stroke prevention options for you. Then take responsibility and enjoy a healthy lifestyle. The lifestyle adjustments — such as eating healthy foods and quitting smoking — made today may reduce the risk of stroke tomorrow. “A Head of Stroke” is dedicated to those affected by Stroke re-contributing to their community. We aim to provide impartial educational information on Stroke prevention, awareness, the effects, rehabilitation, reconnection, tips and tricks that can benefit those most affected by Stroke.This is a New Zealand Web site. Its content is intended for New Zealand resident use. This Web site does not provide medical advice. Information provided on this site is not designed or intended to constitute medical advice or to be used for diagnosis. Due to unique individual needs and medical history, please consult your own personal physician who will be able to determine the appropriateness of the information for your specific situation and they will assist you in making any decisions regarding treatment and/or medication. It could reduce your risk of Stroke incidence.